This painting shows that Henri-Joseph Harpignies is rightly called the ‘Michelangelo of trees’. As one of the leaders of the Barbizon School, he painted outdoors and is known for his depiction of landscapes with grand, prominent trees. 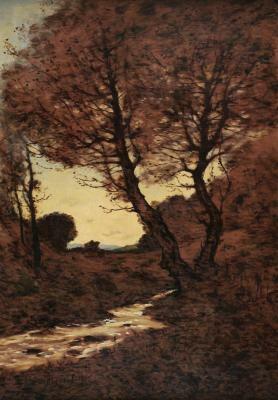 This piece shows us a view of a creek in an autumnal landscape and a prominent two-trunked tree that acts as a strong repoussoir. The construction of the paint layers in the composition is interesting. Instead of applying different layers of paint on top of a base, where mostly foreground covers background, Harpignies worked the other way around in this piece. Starting with a brown base colour, which is to be seen throughout the painting, he later filled in the creamy colour of the sky and other elements. So he actually painted the air through the branches of the tree. Since the work is dated in the lower left corner, we know Harpignies painted it in 1912, four years before he passed away. 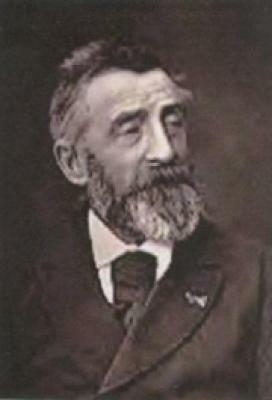 He was a renowned painter during that time, having won the Legion d’Honneur already in 1900. Furthermore, he annotated the work in the lower right corner, dedicating it to his dear friend and companion Rose Maireau: ‘a ma amie Rose Maireau’. Henri-Joseph Harpignies, also known as "the Michelangelo of trees," was born on July 18th, 1819 in Valenciennes, France. He spent most of his childhood working hard at the family's sugar beet factory. It was not until Harpignies reached the age of 27 that he started to paint and was subsequently taught by the landscape painter Achard. When the revolution of 1848 broke out, Harpignies es . . .